My father is eighty-six years old. He has a bad heart, bad lungs, bad kidneys. He uses a cane or a walker to get around. His memory is becoming an issue. He lives with me and my wife in a cozy little area of his own in the lower level of our home. He spends a lot of time these days sitting and staring and remembering. For much of his life he taught high school English. He was a good teacher, in part because he didn’t just deal with academics. 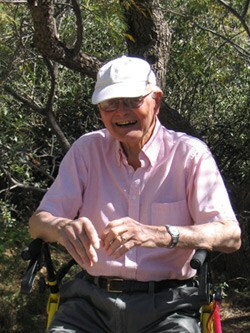 He taught about life in so many of its aspects: ethics and relationship and individual responsibility. He made a difference in the lives of a lot of kids. I say this not just because I’m his son, but because over the years he’s heard from a number of former students who have said basically the same thing. I went to my high school class’s 40th reunion last year, and I heard from a lot of my former classmates about the remarkable influence my father had on them. Brett Favre just announced that he’s going to return for another year as quarterback for the Minnesota Vikings. It’s been reported that he could earn as much as 28 million dollars this year. I don’t mean to take anything away from Brett. He’s a good quarterback and fun to watch. But $28,000,000? When my father taught school, he worked summers at other jobs, as did most teachers, in order to make ends meet. People don’t become teachers because they get paid well. And in the end, maybe that’s the point of this post. We give our athletes—and our actors and our celebrities—outrageous sums to entertain us. But the people who make a real difference in our lives—teachers and ministers and nurses and cops and librarians—often scrape by on what we pay them. There’s something abysmally out of whack in our priorities. Ask my father if he would have done things differently—been a pro quarterback, maybe, or Hollywood star—and he’d tell you that what he received for all that he gave was worth more than money. And what he gave was invaluable. When you read the work of a fine author, what you see, generally speaking, appears flawless and flowing, as if it came naturally and without a lot of struggle. Don’t you believe it. Every author battles to get a work from their imagination onto the page. I’m working on a novel right now. When completed, it will be the eleventh in the Cork O’Connor series. The title is Northwest Angle. The book is set in one of the most remote areas of Minnesota, and the story, as I’ve conceived it, is a convoluted situation of misunderstanding, mostly as the result of prejudice. People die and the where the finger of guilt points—with support of the evidence—is at the wrong man. Even Cork buys into the local prejudices. Add to the pot(boiler) some ruthless smugglers and a foundling child whom death follows like a shadow and you have the general ingredients of the story. So I have a notion of what’s going to occur. I know, more or less, the A, B, C of things. What I’m struggling with is the information and occurrences that will naturally connect the plot points. And therein lies the struggle. In the past, I’ve usually outlined a book, or at least thought the plot through significantly, so I’m almost never worried about the dreaded question that keeps many mystery writers up at night: What happens next? But I’ll admit that in this manuscript I’m flying by the seat of my pants. I struggle with chronology, structure, characters (way too many in this one, I fear), motivation. In essence, everything. I admit there are moments when I’m not sure I can pull it all together. I think to myself, Every author is allowed a book now and then that falls short. So maybe this is going to be the one. I hate myself for even thinking this. I don’t ever want to let myself or my readers down with an effort I didn’t put my full heart into. So I struggle and lie awake at night and live with the fear of failure and every morning I get up and go to the coffee shop and give it my best effort. I remember reading a note John Steinbeck sent to his editor along with the manuscript of The Grapes of Wrath. In the note, he apologized for the book he was delivering, feeling he’d somehow fallen short. Even the greats have struggled. 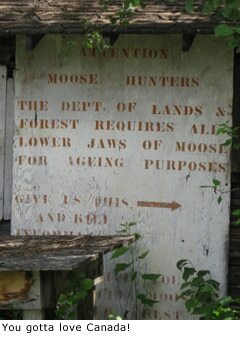 Tim O’Brien, one of my favorite authors, published a marvelous book several years ago titled Into the Lake of the Woods. It is, in many ways, a mystery, one that frustrates a lot of readers because at the end, the protagonist heads off into the labyrinthine archipelago of Lake of the Woods and is never seen again. When you experience this lake, the 14th largest freshwater lake in the world, with its 14,000 islands, you can see clearly how easy it would be to lose your way. These days, most boats are outfitted with GPS that tell you not only where you are but also where the reefs and hidden rocks lie. But in the old days, I’ve been told, it wasn’t at all uncommon to have to organize a search for a boat full of fishermen who’d gone off without a guide. Our second day on the Angle, one of the guides for the Angle Inn Lodge, a terrific guy named Tony Ebnet, offered to squire us around Lake of the Woods. We leaped at the offer. Tony’s been coming to Oak Island for a lot of years, and has been guiding for the folks at Angle Inn Lodge for the last five. 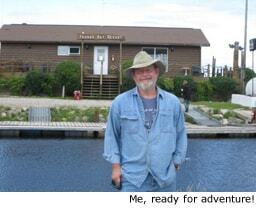 He knows the lake pretty well and has a great repertoire of stories. We headed off about nine in the morning, on a day that we were told was unusually calm. The lake water surprised me. It wasn’t crystal clear, as are so many of the lakes I know in the Arrowhead region. It was the color of strong tea. Tony told us this is from the algae that grows naturally in the lake, a phenomenon noted by the voyageurs over 200 years ago. In Tony’s comfortable launch, we zipped first to Cyclone Island where there’s an unmanned custom station, and we checked in with Canadian officials. Then we began a full day on the lake. We visited Massacre Island, and Tony told us the grisly story behind its well-earned moniker. We cut up narrow passages between islands, veered into picturesque inlets, motored along steep cliff faces, and hit the broad and unusually smooth water of some huge bays. Around noon we stopped for lunch at Wiley Point Lodge, a remarkably modern enclave deep in the remote wilderness. Finally we headed south, back toward the Angle. Along the way, we visited Windigo Island, which is home to the Reserve 37 First Nations band of Ojibwe. Our final stop was at Ft. Saint Charles, a reconstruction of the important fur trading center built in the early 1700’s. I snapped photos like crazy and scribbled madly in the notebook I’d brought. That day on the lake didn’t make me an expert, but it gave me an invaluable sense of the place where my next novel would be set. 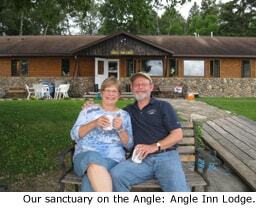 By the time we returned to Angle Inn Lodge, Diane and I were sunburned, exhausted, and at the same time exhilarated. I’ve talked with authors who use the Internet to research the locations for their novels. I’m always more than a little skeptical about the quality of the job they do when creating a story’s sense of place. Me, I have to go there. And I’m always glad I did. The Northwest Angle: A geographic anomaly, a small triangle of American territory completely isolated from the rest of Minnesota, cut off from the United States by sixty miles of Canadian wilderness and the vast, mysterious waters of Lake of the Woods. 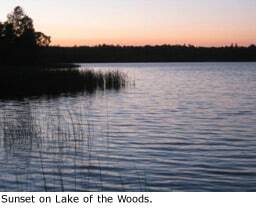 Lake of the Woods: One of the largest bodies of water on the North American continent. Straddling the U.S. Canadian border, it is eighty miles long, sixty miles wide, and contains more than 14,000 islands, mostly uninhabited. 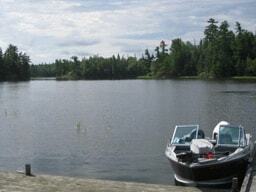 This is the best walleye-fishing lake in the world. It has also become a notorious avenue for international smuggling. Like many Minnesotans, I’d heard of Lake of the Woods and the Northwest Angle, but I’d never paid much attention. These were places so far north that not many people—except really rabid walleye fishermen—ever went there. But nearly a year ago, while casting about for a good seed idea for the next Cork O’Connor novel, I happened to visit the Kitchigami library system (think Brainerd) in northwestern Minnesota. After one of the events, I went out with the librarian and some other folks for a beer or two. 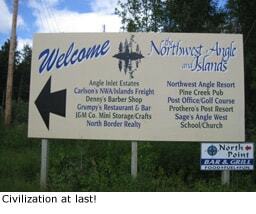 For reasons I can’t now recall, talk turned to the Northwest Angle. When I heard, really heard, about this place, all my sensibilities as a mystery writer tingled. Here was a remote, little known area surrounded by a vast body of water that contained a gazillion, mostly wild islands, with an international border running through it. In addition, much of the land was held by the Ojibwe. I thought to myself, All kinds of criminal activities could go on out there, hidden among those islands. Honest to god, by the time I’d returned to St. Paul, I had a rough outline of the story already in my head. But I’d never been to the Angle, as it’s called by locals. And because I write profoundly out of a sense of place, I knew I had to visit the area and spend time on the Lake of the Woods. So in mid-July, that’s exactly what I did. Internationally speaking, the Angle is problematic. After driving almost eight hours north from the Twin Cities, you hit the border just outside Warroad, Minnesota. You have to pass through customs where, because of the events of 9/11, passports have become necessary. Then you drive another hour on mostly back road, some of it pretty rugged, and, in the middle of a great woodland, cross the border back into the United States. There’s no customs office at that point, only a sign noting the shift of nationality. A few miles farther, you come to a place called Jim’s Corner, where there’s a little, unmanned booth with a video phone and instructions (a little vague) on how to call into U.S. customs to report your entry. Sometimes the videophone works and sometimes it doesn’t. For me, it didn’t. So I entered the U.S. technically illegally. I would later learn the horrible potential in this action. We drove, my wife and I, for several more miles along the dusty washboard road through thick forest until we finally came to the Angle. I was surprised. In a place so far removed, I’d expected primitive conditions. The Angle is remarkably modern. Electricity, land phones, even Internet. The only thing you can’t count on is cell phone reception. It’s pretty hit or miss (mostly miss) up there. At Young’s Landing, we were picked up by Deb of the Island Passenger Service and ferried out to Oak Island, where we’d made arrangements to stay at the Angle Inn Lodge. Our wonderful hosts, Debra Kellerman and Tony Wandersee, greeted us and our Lake of the Woods adventure began. In my next posting, I’ll tell you all about our exploration of that incredible lake and the graciousness of the folks who call it home. One of the first tenets pounded into my head in every writing class I ever took was this: Write what you know. We’ve all heard it. But when most authors in my genre sit down to write a book, they’re faced with the realization that they know little or nothing about much of the information the story will demand. Like myself, most of my colleagues in this business began with ignorance concerning police procedure, forensic investigation, firearms, ballistics, or psychopathology. (Some of the lucky authors—Michael Black and Robin Burcell and Michael McGarrity—were honest-to-god cops before they turned to writing, but they’re the exception.) So what do we do? We do research. Okay, it’s confession time. I almost always begin my research these day by turning to the Internet. It’s a wealth of information (and misinformation). The Internet gives me an idea of the scope of what I’m trying to understand, and more often than not points me in the right direction. From there, I usually move to reading: periodicals, books, newspapers, all the more reliable sources. And finally, I make contact with someone in the field who has firsthand experience with whatever it is I need to know. Over the years, I’ve talked with beat cops, homicide investigators, coroners, M.E.s, rural sheriffs, agents of the FBI, the Secret Service, and Minnesota’s own Bureau of Criminal Apprehension. I’ve talked with guides in the great Northwoods of Minnesota, divers in Lake Superior, morticians (got a really great tour of a prep room! ), judges, prosecutors, criminal defense attorneys, emergency room doctors and nurses. And, of course, I talk a lot with the Ojibwe. Despite the fact that I’ve been at this for a very long time now, I’m still reluctant to approach a source I don’t know. I’m always a little afraid I’ll be intruding somehow. But the truth has always been that people love to talk about what they do. Most people are incredible generous with their time and their knowledge. And I always learn something of amazing value. Here’s an example: In my stand alone thriller, The Devil’s Bed, I needed to have a mental patient incarcerated in a high-security facility make an escape. I made arrangements to tour the Regional Treatment Center in St. Peter, Minnesota, where the most dangerous of the state’s criminally ill are confined for observation and treatment. It turned out that the facilities manager, a guy named Tom Kramer, was a fan of my work, and he gave me a stellar tour. What I found was an imposing complex surrounded by high fences with razor wire and with multiple perimeter alarms. At the end, I turned to Tom and said, “I don’t know how anyone could escape from this place.” Tom smiled and said, “Oh, but I do.” He proceeded to describe for me the most recent escape from the facility, and it became the foundation for the method of escape I used in The Devil’s Bed. This kind of thing happens all the time. Meeting these generous folks, hearing their fascinating stories, filling in the vast areas of ignorance in my own knowledge, these are all perks of my job. God, I love what I do! I just recently returned from a research visit to a fascinating and little known area of Minnesota called the Northwest Angle, where the book I’m currently writing for the series is set. In my next blog, I’ll tell you about that incredible visit.